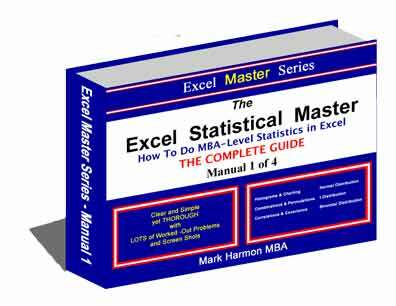 With the 4 eManuals of the Excel Master Series. See how easily you can create a fully-interactive Excel graph of the Normal Distribution. Watch this streaming video right out of Chapter 15 showing step-by-step, easy-to-follow instruction on how to create a user-interactive Excel graph of the Normal Distribution. This is just 1 of the 23 streaming videos in eManual 4 of the Excel Master Series. Check out how simple it is to solve MBA-level Normal Distribution problems in Excel. You will immediately be able to do this after downloading this short section of chapter 4 of the Excel Master Series. Quickly learn how to perform Independence Tests using ANOVA in Excel. This chapter shows you in step-by-step, easy-to-follow instructions how to set up Independence Tests with ANOVA, how to run them in Excel, and how to interpret the output. This is a valuable statistical skill that you will be able to apply at your workplace as soon as you have viewed this chapter.